SAN JOSE, Calif. (AP) -Although Jeremy Roenick and Curtis Brown have been quite happy to take supporting roles for the Sharks this season, the two veteran forwards still can provide an occasional scoring kick to keep San Jose on its blistering pace. Roenick scored his 507th career goal and added the decisive shootout score as the Sharks clinched a playoff berth with their 13th victory in 14 games, 4-3 over the Minnesota Wild on Wednesday night. Roenick and Brown each had a goal and an assist, and Evgeni Nabokov made 21 saves in his NHL-leading 42nd victory for San Jose, which has 27 points in its 14 games since Feb. 21 after beating Minnesota for the seventh straight time. While Roenick tied Jean Beliveau's career goals total with the latest score in his revitalized season, Brown simply was grateful to be back on the ice after missing 25 games with a hand injury. "It doesn't matter who gets the credit, but the points are huge," said Brown, who hadn't played since Jan. 19. "You don't ever want to give up the lead late like we did, but when you do, the next-best thing is to come out and get that extra point." The Sharks have the NHL's second-best record with 97 points, but their latest win had a somber tone after Minnesota defenseman Kurtis Foster broke his left leg in the second period. 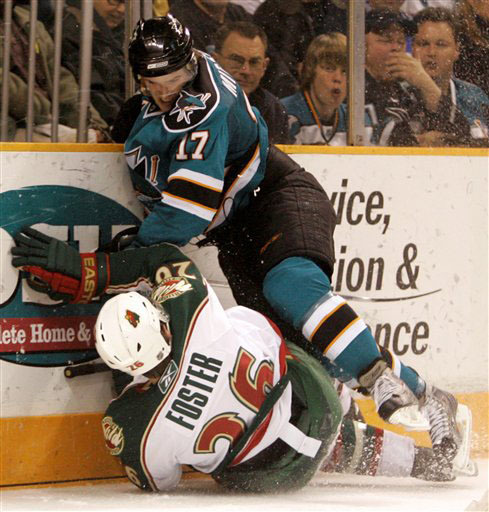 Foster, a third-year pro, hit the boards violently after a collision with San Jose rookie Torrey Mitchell. "I feel real bad for the kid," said Roenick, who shook Foster's hand as he left the ice on a stretcher. "It takes a lot of guts going in there with speed. Going in there that fast, there's going to be some bad things happen." Joe Pavelski put the Sharks ahead with 2:02 left in regulation on an awkwardly angled shot set up by Milan Michalek, who stole a puck behind the Minnesota goal and fed Pavelski for the go-ahead score. But after a penalty and an empty net gave the Wild a 6-on-4 power play, Marian Gaborik slammed home his second man-advantage goal of the night with 28 seconds to play. 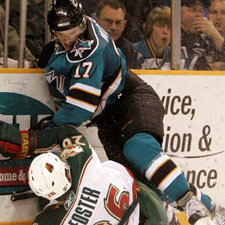 Roenick scored the decisive shootout goal in the third round when Niklas Backstrom couldn't hold on to his hard shot. Nabokov stopped Mikko Koivu to end the meeting of division leaders, gleefully kicking the puck after dropping it out of his glove. "Our team gave an unbelievable effort considering it was our third game in four nights," Sharks coach Ron Wilson said. "We're just focusing on winning our division and finishing ahead of any team in the East." Gaborik scored a quick power-play goal early in the third period of the Wild's first stop on a four-game road trip that carries serious playoff implications. Stephane Veilleux also scored for Minnesota, and Backstrom stopped 29 shots in the Wild's sixth loss in eight games, though they still lead three pursuers in the Northwest Division by two points. The Wild were more worried about Foster, who went hard into the boards when Mitchell touched him from behind as their skates got tangled while chasing a puck for icing. The Minnesota defenseman left the ice on a backboard and a stretcher with a splint around his left leg. He was expected to have surgery Wednesday night at O'Connor Hospital to insert a stabilizing rod into his leg, the club said. Foster remained on the ice for 12 minutes, but was moving his head and talking to paramedics when they lifted him off the ice. Mitchell got only a two-minute penalty for tripping, prompting anger from Minnesota coach Jacques Lemaire. Notes: Sharks D Kyle McLaren got the night off to rest his surgically repaired left knee, and C Marcel Goc was a healthy scratch with Brown in the lineup. ... Gaborik had just one goal in his previous 10 games against San Jose. ... Nabokov got just his third night off this season on Tuesday when Brian Boucher backstopped the Sharks' 2-1 win at Los Angeles, but returned to make his 70th start.